England - Over 100 (6), Scotland - 'Over 50' (4), Ireland - 3, Wales - 9. What exactly is a Cursus? What was the function of Cursus? When were they first constructed made? List and Description of UK Cursus. Still very little is known about these long, narrow earthwork structures date from the Neolithic period, many from around 6,000 years ago - and thus some of the oldest monumental structures in the British isles. They have been found across Britain from southern England to Ireland and Scotland, and stand beside some of the most famous archaeological sites in Britain, such as at Stonehenge, Thornborough and Newgrange. What is a Cursus ? Definition: Concise Oxford Dictionary of Archaeology. 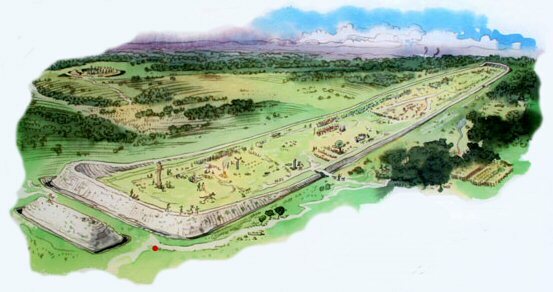 Artist's impression of Stonehenge Cursus. Cursus monuments are essentially very long and relatively narrow rectangular enclosures, with a near continuous boundary of an interior bank and an exterior ditch. The only breaks in this boundary are the 'causeways', or possible entrances. The ends of a cursus are either squared-off or rounded. In Scotland, about half the known sites (which now number over 50) have a boundary of pits or post-holes which held large upright timbers, rather than earthwork perimeters. A few sites have a single mound running along their centre, rather like a bank barrow. The name 'cursus' derives from the 16th century antiquarian, William Stuckley's nineteenth century idea that they were 'prehistoric racetracks'. This idea has long since evaporated and current thinking favours the idea that they may have served as processional or ritual gathering places. It has been observed that cursus' often appear to incorporate funerary monuments in their design, although these may have been added later. Manley (1), says 'It seems likely that they were in some way utilised for astronomical purposes', (1) an idea which appears supported by the observation that the Dorset, Stonehenge, and Newgrange cursus' appear to show significant alignments for astronomy (2) (see below). Manley (1) also suggests that the Scottish 'double alignment of pits (often closed at one end)', could also be related to Cursus'. A 'British Archaeology' article by K. Brophy (4), suggests that there may be a connection between cursus monuments and streams and rivers. 'The majority lie on flood-plains or river-terraces, close to the river. The Dorset Cursus and the Eskdalemuir bank barrow in Dumfries and Galloway are amongst several possible cursus which cross, or are crossed by, rivers. Some sites are completely surrounded by waterways, like Maxey Cursus in Cambridgeshire. Old Montrose Cursus in Angus sits on a raised area of a valley floor which, in the event of flooding, could become an island. Other sites may have had seasonally flooded ditches, creating a powerful visual image when sunlight reflected off watery ditches stretching across the landscape'. A convincing argument is put forward by Robson (8), for the theory that cursus may have had their origin as large ungulate traps for migrating pasture animals such as deer or cow. The remains of hundred year old caribou traps can still be seen today in Canada, which although not used since, still stretch across the landscape for miles. This idea is clearly not in line with modern thinking as it suggests that the motivation behind the labour was primarily survival, and that any ceremonial funerary (and occasional astronomical) associations are ritualistic or secondary additions. Fences are built across the path of a known migrating herd. Animals are herded towards the cursus, then into its environs, where they become effectively stuck. The animals are later selectively removed from the cursus, leaving little or no remains. The presence of causewayed entrances, banks and ditches. It explains the presence of a river at many sites. It explains the lack of astronomical continuity at cursus. The presence of wooden stakes at the ends of Scottish cursus. When were Cursus First Constructed? There are several curses dated at before 3,000 BC (Dorset, Thornborough, Boyne-valley, Stonehenge). A fact which shows how the location of certain important Neolithic sites have been retained and re-used over time. The Scorton cursus, is dated at around 3,500 BC, with the oldest cursus appearing in Britain at around 4,000 BC (4). There are two cursus at Stonehenge, the nearest, which is also the largest, is orientated directly towards the 'Woodhenge' monument. 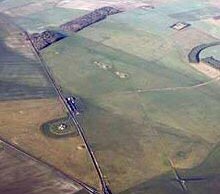 The fact that both the Dorchester-on Thames Henge in Oxfordshire, and the Thornborough cursus can be shown to have been built over by henges, illustrates the antiquity of these mysterious structures. The Rudstone landscape also show the presence of a cursus. 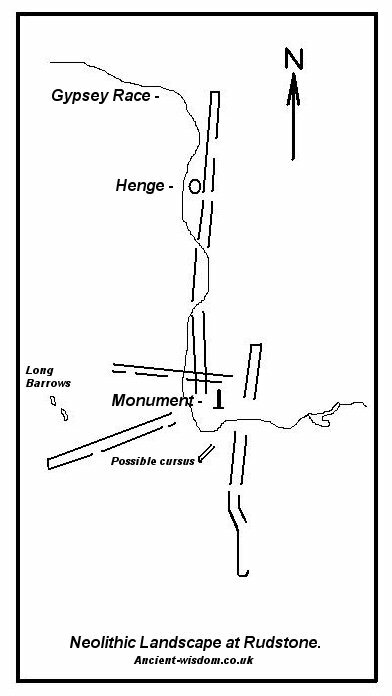 In light of this finding, it seems a reasonable to propose that the cursus and the henge are in some way related, as they both share the same intrinsic design features: Being areas of flattened land surrounded by banks and ditches - creating an artificial horizon line. The Henge being a latter, refined version of the previous linear cursus form. Dorset Cursus - The longest known Cursus in UK runs for nearly 10 Km and was laid out sometime around 3,000 BC. The Dorset Cursus is actually two Cursus joined end to end with an elbow in the middle (1), with the southerly Gussage Cursus pre-dating the northerly Pentridge Cursus (Wilipedia.org). Service and Bradbury (2) say of the Dorset cursus that it... 'aligns at various points with horizon markers that indicate the rising or setting places of some important phases of the moon'. Forham (All Saints) Cursus, Bury St Edmonds, Suffolk. Stonehenge Cursus - There are two Cursus at Stonehenge. The main cursus is aligned with nearby Woodhenge, and can therefore be considered astronomical in nature as the Stonehenge-Woodhenge alignment is orientated along the path of the midsummer sunrise. (see Alignments for more). Stonehenge Cursus (left), and Stonehenge lesser (Right). New Pits Discovered in the Stonehenge Cursus. Article: BBC News: Nov 2011. It is thought the pits, positioned within the Neolithic Cursus pathway, could have formed a procession route for ancient rituals celebrating the sun moving across the sky at the midsummer solstice. Also discovered was a gap in the northern side of the Cursus, which may have been an entrance and exit point for processions taking place within the pathway. These discoveries hint that the site was already being used as an ancient centre of ritual prior to the stones being erected more than 5,000 years ago, the team said. Dorchester on Thames: Unfortunately, much of its course has been destroyed by gravel quarrying and the construction of the Dorchester bypass. 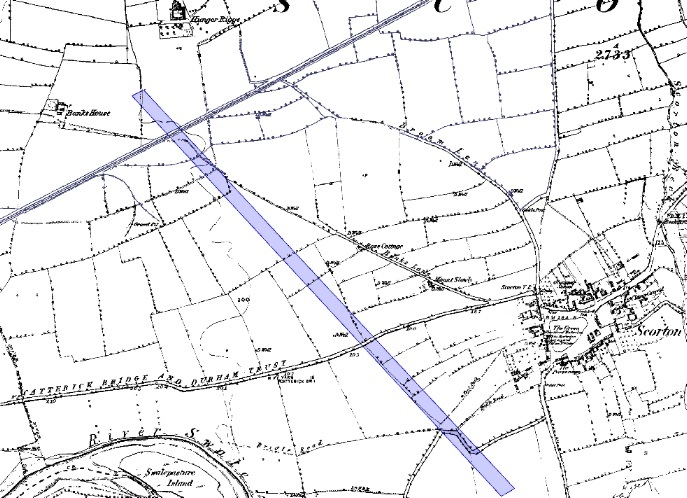 It comprised two broadly parallel ditches circa 60 metres apart, running for at least 1600 metres in a more-or-less northwest-southeast direction. As with other prominent Cursus, this one has a Henge associated with it, and one which measures the same dimensions as the one at Stonehenge (366 MY circumference). An antler from the primary fill has been dated to 3380-2920 BC (calibrated), though whether this genuinely dates the Cursus construction is open to debate. However, dating evidence recovered from earlier and later monuments in the complex supports a broad 2nd half of the 4th millennium BC date, in line with Cursus monuments generally. Rudstone cursus'- There are four cursus' (possibly five) at Rudstone, all converging on the great menhir in the centre of the village (The largest standing stone in Britain). The Rudstone complex offers us a tantalising glimpse of the prehistoric ritual landscape, and reinforces the idea that Cursus' may have had a ritual or ceremonial function. Thornborough - The Thornborough cursus was built over at around 3,000 BC with three henge-circles, suggesting that the location itself already had a significance to the builders. This re-use of a site combined with the later construction of Henges can be seen at other sites such as Stonehenge, and the Dorchester-on-Thames Cursus (Both of which share a common circumference of 366 MY, which is half that at Thornborough). The Thornborough complex is now recognised as an important part of the 'ritual landscape' in prehistoric Britain. Scorton Cursus - Several miles north of Thornborough. This cursus was originally about 2.1km long and aligned SE-NW. Clustered round the monument were a number of ring ditches, one that was excavated had a single burial with a beaker. This would date the site as being in use from around 3,500 BC until at least the Bronze Age c.2,000 BC. The Cursus was cut almost 'dead-straight' over it's entire length and was 37.2m wide. The Cursus was constructed by digging two parallel ditches 4.10m wide on the east side and 3.90m wide on the west. Newgrange cursus - The cursus is barely visible today but extended around 100 m from the valley of the River Mattock to climb the ridge occupied by the Newgrange tomb. Here it is rounded off by a terminal bank. The Cursus was around 20 m wide. The Boyne valley, which includes Newgrange, Knowth and Dowth, is a huge celestial observatory, enabling the builders to determine the phases of the solar and lunar cycles. This reinforces the idea that Cursus probably served an astronomical function. The Boyne Valley Cursus is orientated to the winter solstice sunrise, as is the Newgrange passage mound. Loughcrew - Archaeological attention has recently focused on the land below Slieve na Calliagh, in particular to the north. Here Conor Newman noted for the first time a cursus-like monument 150m SW of the Ballinvalley stone circle. 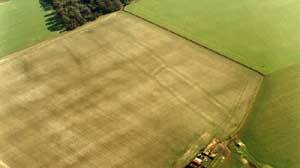 "A cropmark of two parallel ditches orientated SE-NW, 15m apart and traceable for some 130m. It runs perpendicular to the present course of the River Wye 50m to the NE. No terminals are visible, but there is a large ring ditch across the river 450m to the NW. A closely-grouped cluster of some 8 ring ditches is visible on a gravel terrace some 150m to the E," but adds finally that "the identification of this site is suspect and may represent a fossil field system." SO162378 (52° 1' 54.43" N, 3° 13' 18.05" W). The Walton Green Cursus - The south west end of the site is at SO26195978 and north east end is at SO26826001. Measures 660m long by 30m wide, with squared ends and rounded corners. Hindwell is set in an area full of Neolithic activity, including two cursus monuments. Llandegai - Discovered as a crop-mark during the long dry summer of 1959 by air photographers from Cambridge University, the prehistoric burial and ritual complex at Llandegai is among the most important prehistoric landscapes anywhere in Wales. 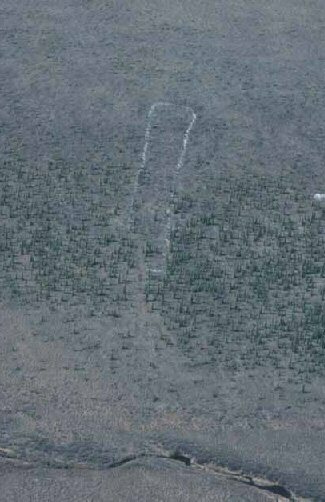 The air photo mapping shows the main features: with two circular henge monuments dating to circa 3,000 BC and the parallel ditches of a roughly contemporary cursus, or ritual avenue, to the right. 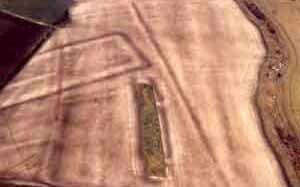 Llandisillio - Aerial photography has revealed an enclosure at Pencnwc while a most exciting discovery, by Dyfed Archaeological Trust, has revealed a linear crop mark across the village which may be evidence of a cursus – part of some ceremonial complex, possibly dating from the Neolithic period. Sarn-y-Bryn-Caled - The cursus complex at Sarn-y-Bryn-Caled is a long, rectangular ditched enclosure about 10 metres wide and 400 metres long. It has banks on the outside of the ditches and was dated to the Neolithic period about 3,700 BC. Welshpool - An important complex of prehistoric ritual monuments occupies the fields to either side of Dyffryn Lane, Berriew, about 4 miles south of Welshpool in the Severn valley. The earliest sites appear to be a Neolithic long barrow and a nearby enclosure, both of which are known to date to about 3,500 BC. Two possible rectangular timber house sites might be of either Neolithic or early medieval date and the complex also includes a possible Neolithic cursus monument which, like many of the other sites, has been identified by aerial photography. Brecknock - Another possible Cursus monument has been identified in Brecknock, lying close to the River Wye at Pipton. 1) J. Manley. Atlas of Prehistoric Britain. 1989. Oxford University Press. 2). A. Service, J. Bradbery. Megaliths and their Mysteries. 1979. Macmillan press. 3). Cope, J. The Modern Antiquarian. 1998. Harper Collins Publ. 5). Barclay & Harding's Pathways and Ceremonies, Oxbow: Oxford 1999. 8). A.S. Robson, Stonehenge and the Anasazi Roads. Prehistoric Publishing. Do you want to pass N10-005 ? Check out our latest 000-781 material which gives you 100% exam pass guarantee of 1z0-054 . You can also get ccna syllabus and gmat sample test.